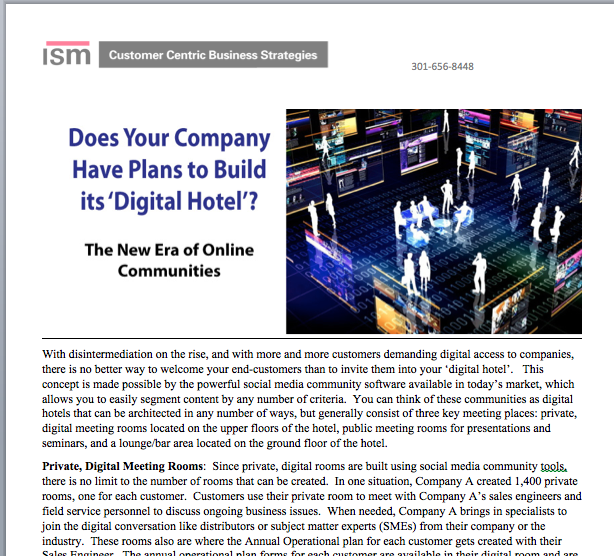 Does Your Company Have Plans to Build its ‘Digital Hotel’? Complete the form below to download our ‘Does Your Company Have Plans to Build its ‘Digital Hotel’? Private Online Communities‘ Thought Leadership Paper. More and more customers demanding digital access to companies, there is no better way to welcome your end-customers than to invite them into your ‘digital hotel’. This concept is made possible by the powerful social media community software available in today’s market, which allows you to easily segment content by any number of criteria. You can think of these communities as digital hotels that can be architected in any number of ways; from private meeting rooms for your sales staff to meet with customers and store critical documents, public digital meeting rooms for presentations and seminars, to social settings “lounge” to share ideas with other members of the community to ask questions to peers. Download this thought paper to discover the the new age of customer engagement. To learn how ISM can help you with your private social media community click here. Customers become advocates for your company’s products and services. Distributors sell more product and provide better service. Your company learns by listening carefully to what your customers are saying to you and to their peers, and this ‘social insight’ then is stored in the Customer Profile section of your CRM system. Most importantly, new sales result from customer participation in the private, digital rooms as well as in the public lounge/bar area.